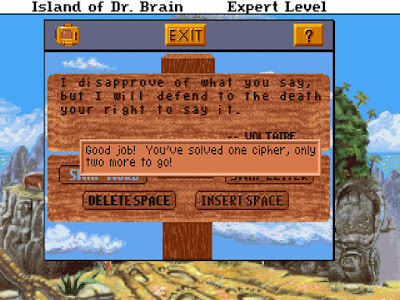 The bridge triggers "Dr. 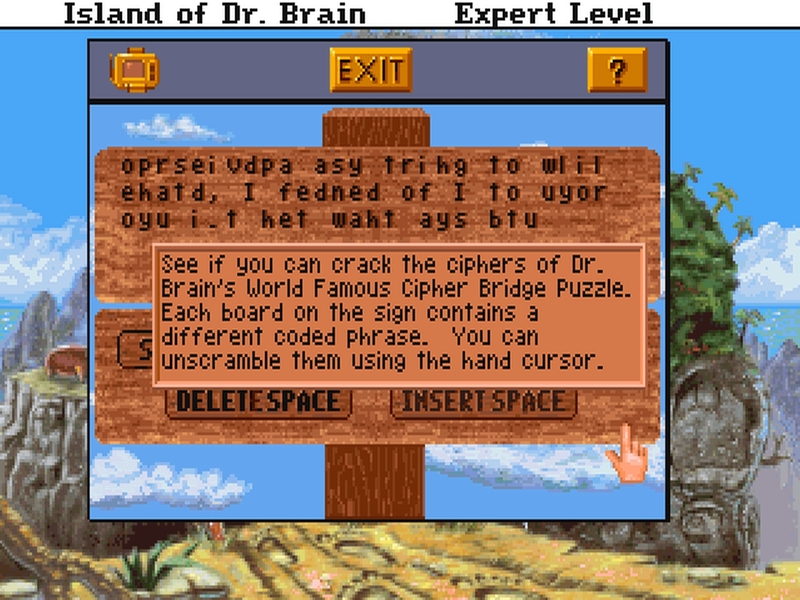 Brain's World Famous Cipher Bridge Puzzle" (what a mouthful!). I usually like ciphers, but these are a little annoying because they aren't actually ciphers at all; they're multi-word anagrams. In the puzzle context, I would define a cipher as information written in code which has to be decoded. The usual puzzle ciphers are substitution ciphers, like at the end of Castle of Dr. 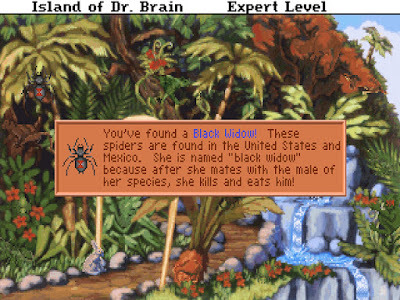 Brain where the alphabet was shifted by one letter, or sometimes each letter is arbitrarily substituted with another letter or even a different kind of symbol, like the symbolic messages sent by one of the alien races in Alien Legacy. Other ciphers are lookup ciphers, where the code references words from a specific source like a book. 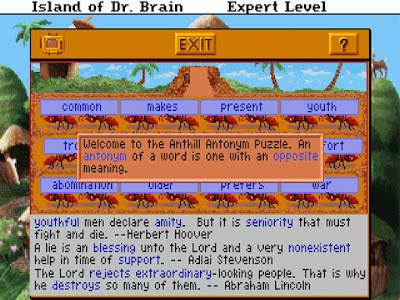 But this bridge puzzle, at least on Expert level, includes two kinds of anagrammed sentences: one kind where each word is scrambled and then the order of the words is also scrambled; and another kind where the words are in the right order, but the letters are scrambled and also spaces are in the wrong places. Not ciphers! All the information is there; it's just a matter of reordering it correctly. With a cipher, the code is often necessary to decrypt the message: the substitution arrangement, or the lookup source. Given that additional information, the message can be decrypted even if it isn't understood, like a message in a foreign language. A simple enough cipher can be broken even without the code, but that requires some linguistic and grammatical analysis. But with anagrams, the only way to reconstruct the original message is to figure out the right order of the pieces by analyzing the content. Some kinds of messages can't be anagrammed without losing the information, like a phone number. Each sentence is usually a famous quote, so once part of it is figured out, that gives momentum and the rest is easier by context. For instance, Voltaire: "I disapprove of what you say, but I will defend to the death your right to say it." After three quotes, one for each of the three planks that the bridge needs, then the puzzle is complete, and I get a gold plaque for Decoding. For some reason, this is considered a Math puzzle, not a Language puzzle. How many of the 15 remaining animals can you see in this picture? 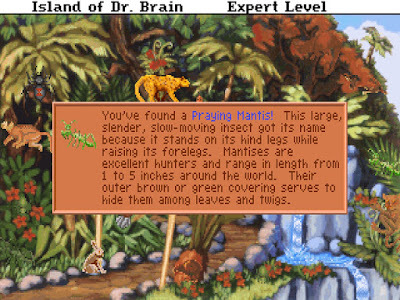 Next up is the Botanical Garden puzzle, which I personally find to be the most annoying puzzle in the whole game, because it just involves finding camouflaged animals hidden in the forest scene. The annoying part is that you have to draw a box around the animal with the mouse, and it has to be close enough around the shape of the animal before the game will recognize that you've found it. Often it's extremely difficult to see the extent of the animal's shape in order to select it properly even if you know where it is. This praying mantis was well-hidden in the picture, too. There are sixteen animals in the picture, randomly placed, and often duplicated. 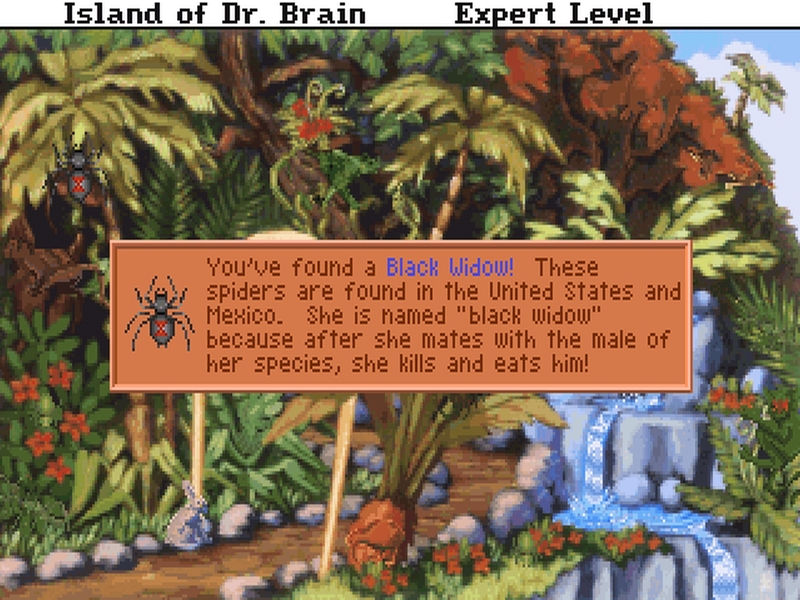 For instance, in this case I found two ant lions and two praying mantises, along with twelve other animals from a scorpion to an African leopard to a kiwi (the Australian bird, not the fruit). They are not depicted to scale relative to the forest or each other, either. 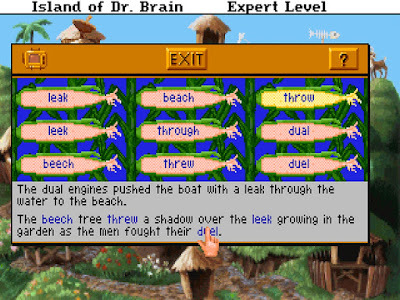 At least the game will tell you if you're close, but it can be aggravating to think you're selecting the animal correctly, only to have it cheerfully tell you that you're warm, but it's not good enough. Finding all sixteen animals nets me a gold plaque in "Visual Skills". Again, a Math puzzle, not a Science puzzle. What? 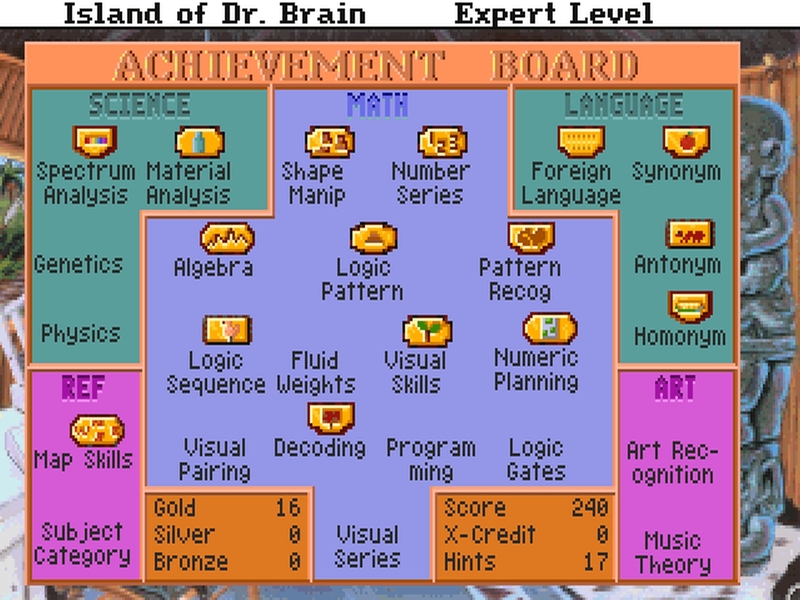 I don't get why both the Science and Language areas of the Achievement Board couldn't have included one additional puzzle (to maintain symmetry) instead of lumping all these other things in with Math when they clearly aren't mathematical. It's as good as telling me I need to look up the periodic table for information. After I exit the completed puzzle, a "mysterious bag" magically appears in the path, which I'm told contains items for the Volcano Door Analyzer. I can then use that to tackle the door into the mountain. 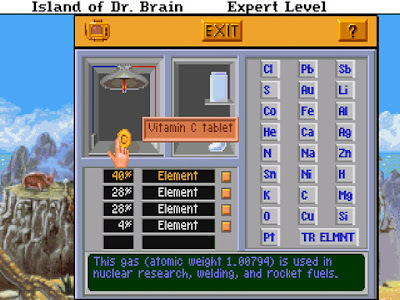 Here I have to identify the constituent elements of three ordinary objects such as baking soda (Sodium, Hydrogen, Carbon, and trace elements), or a plaster cast, or a Vitamin C tablet. Hydrogen! 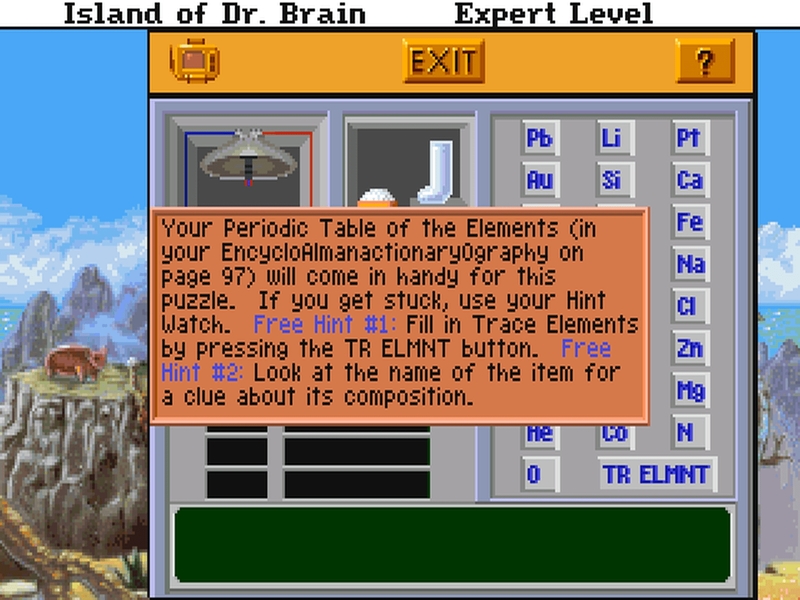 The clue often includes atomic weight, which is unambiguous. Each element has a descriptive clue which by common sense and process of elimination makes it relatively straightforward to identify. 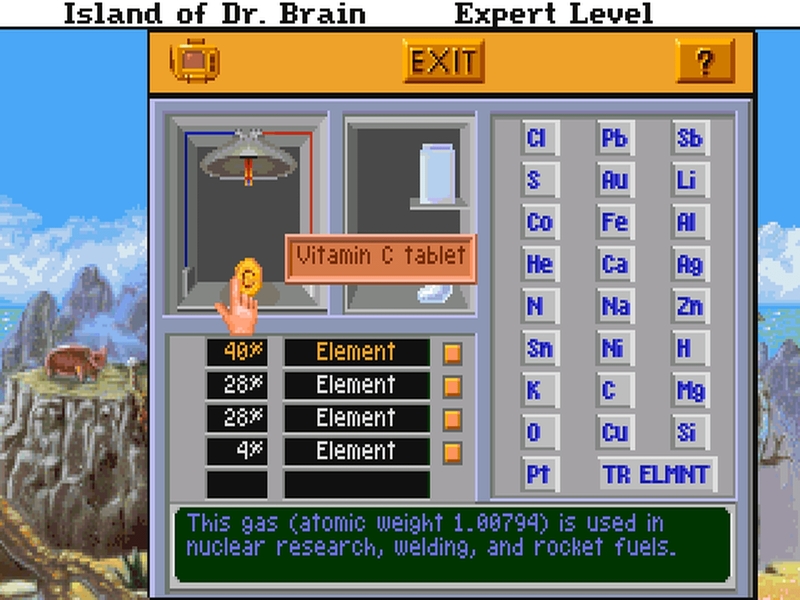 I used a periodic table, because the game outright suggests that the information is available in the reference materials provided with the game. 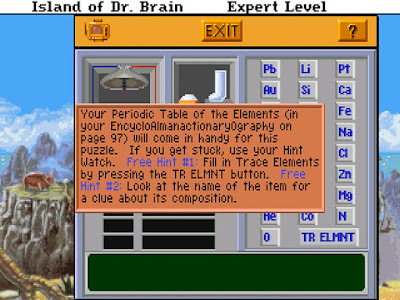 Completing this puzzle yields a gold plaque for "Material Analysis" (properly Science this time). Then I get an extra message from Dr. Brain, in which he informs me that he's completed his invention and would like the battery "at your earliest convenience." 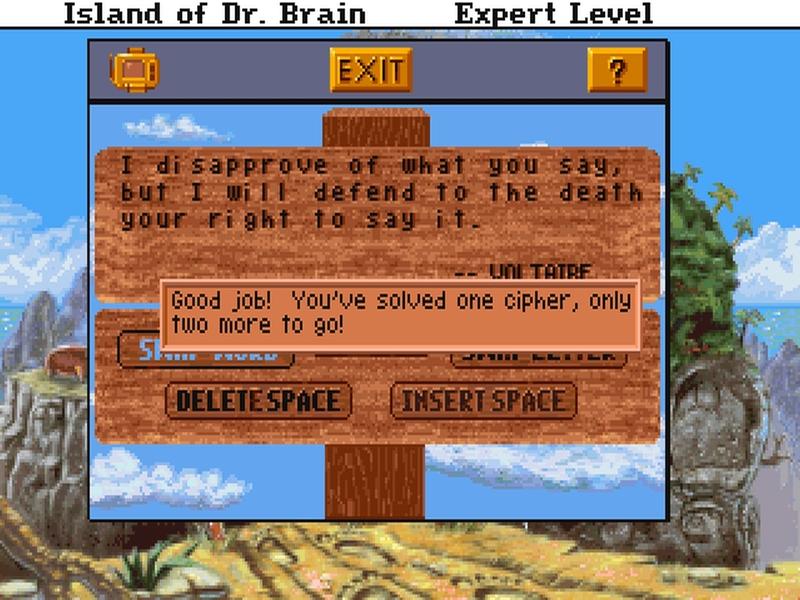 I don't think there's actually any time limit, so this seems like just a bit of flavor to remind the player why they're working through all these puzzles in the first place. a lot more puzzle solutions available if the totals vary. The door opens right onto a room built around the top of a volcano, complete with lava. There's even a lava lamp in the foreground! 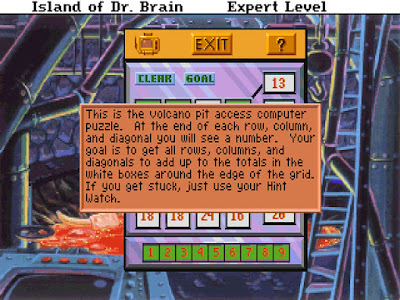 First I have to solve a number puzzle to access the volcano computer. It's a sort of uneven magic square puzzle where each row, column, and diagonal has to add up to a specific target number, but not all the same number. It's solvable by trial and error, mostly, by making some guesses and then swapping numbers around to get the sums closer to the targets until everything matches. The puzzle even has two display modes where it will show either the target totals ("Goal" mode), or the differences remaining from the target totals ("Need" mode). Dr. Brain calls this puzzle "Numeric Planning". At this point, flooring slides shut over the top of the volcano so that I can reach the spectral analysis machine on the other side of the room. That floor looks metallic, so I'd assume that it would be awfully hot if it's sitting right over molten lava. Maybe I can just dash across and then stand on the ledge on the other side to work the next puzzle. The last element doesn't match the pattern, so then I can select the ones that did match. The game informs me, "The door is locked with a Spectrum Analyzer Puzzle". I found this one to be very easy. It provides a composite pattern formed from the spectral analysis of a specific combination of elements. 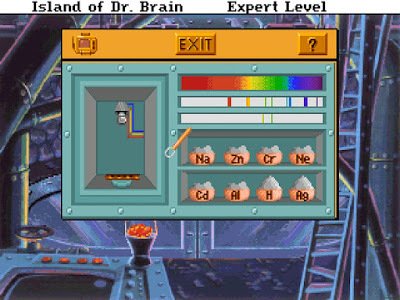 I just tested each element individually, noted which ones matched part of the pattern, and then tested the combination of those matching elements. Sometimes the patterns overlap a little bit, but not much. 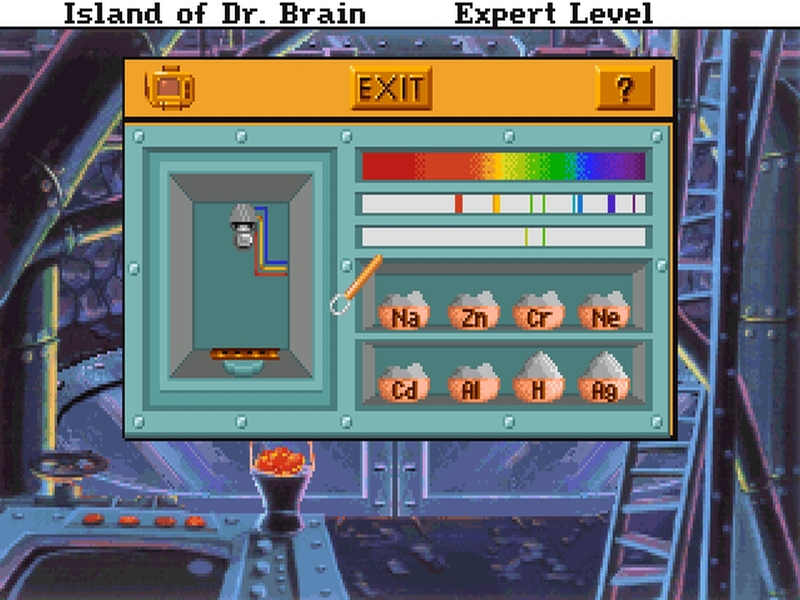 On Expert, the combination includes six of eight elements: easier levels would include fewer elements. As you can probably guess, completing the pattern gives me a plaque for "Spectrum Analysis". When I unlock the door, suddenly the island experiences an earthquake. What did I do? Am I in danger? I pass quickly through the door into a village area with several small cute grass huts and lots of plants, including cornstalks and apple trees. One hut has an inedible slice of pizza attached to the top. Another has a fish skeleton. Some places have larger bones for decoration. Let's hope those are all animal bones. I hate it when people use "threw" instead of "through". I try the corn first and find the Hominy Homonym Puzzle, where I have to fill in the correct spelling of words that sound alike in various sentences, where the words on offer are displayed on ears of corn. It's made easier by the fact that, of a particular homonym pair, one word is used in each of the two sentences. I have little difficulty with homonyms usually, so I make short work of the puzzles. It's only tricky when the sentence is short enough that it's hard to tell what it's actually saying with four words removed. Completing three sets gets me a Homonym plaque (of course), plus a bucket of ground corn. I'm not sure why identifying homonyms would grind the corn, but okay then. Classic poetry. Who can name the writer? After three sets, I get the Synonym plaque and also a bucket of apples. I place it next to the bucket of corn on the counterweight, but I still need something else. I poke around some more and discover some amusing things: clicking with the hand on most of the huts triggers an animation of a cute little robot (??) dancing or doing something. There's some laundry hung up to dry in the background which are also described as robot clothes. What? This is a village of robots? What do they need with clothes? Or fish? Or decorations...? How strange. 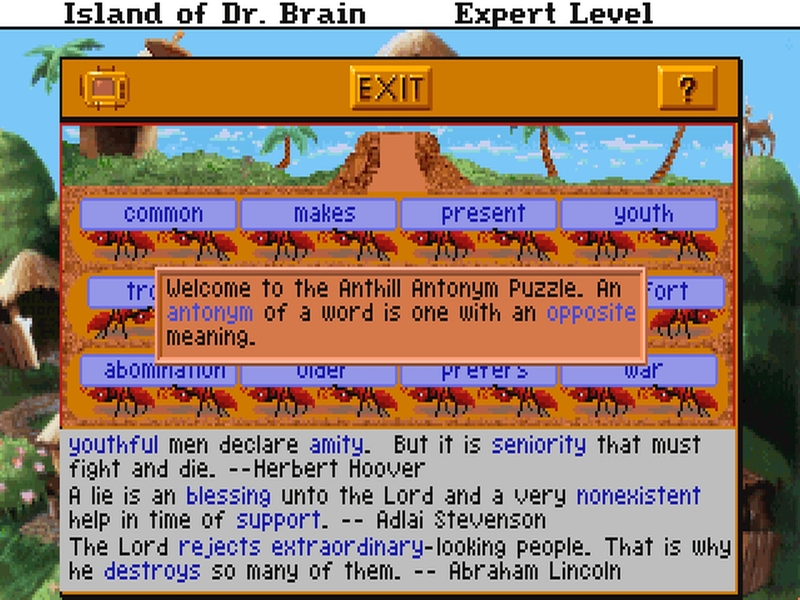 The third puzzle is the Anthill Antonym, which works similarly to the other two: I have to replace words with their opposites, but this time ants bear the available words on their backs. Plus this time I have twelve available words to replace nine words in three famous quotes. 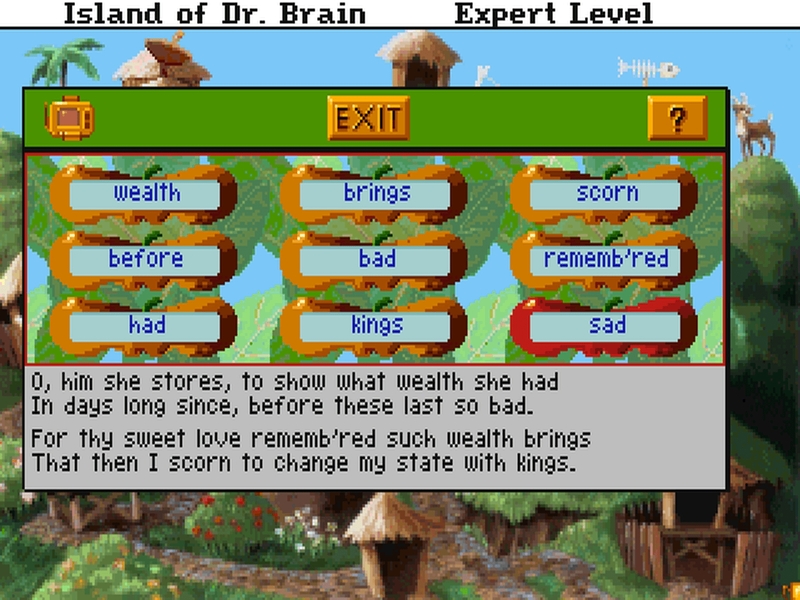 In the other two, I had nine available words for eight slots, so it was much easier to use process of elimination to decide which word wasn't necessary. This time I have more words available so it's actually a bit trickier. Being familiar with some of the famous quotes helps, though. After just two sets, I get the Antonym plaque and also a...watermelon? Where were the ants hiding that thing, and why? Still, the watermelon is enough to counterweight the bridge, with the two buckets. Here I'll also mention that placing the items on the counterweight is nearly a pixel hunt, because if you aren't placing them in just the right place, the game boldly tells you that the item should be used elsewhere. That could be a bit misleading, except that this is a self-contained screen and there's really nowhere else to put them anyway. 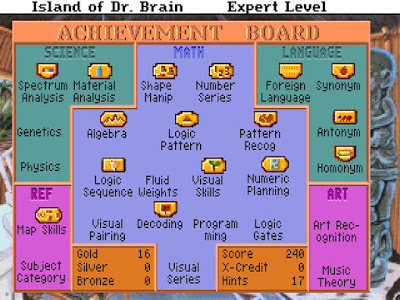 The Achievement Board after sixteen puzzles. Here's where I'll stop for now. Next time we'll check out the crazy hut with all its odd decorations. On ciphers vs. anagrams: There is a class of ciphers that rely entirely on permutation of the plaintext, rather than replacing the plaintext with ciphertext. The defining characteristic is that such permutation is applied using a particular rule or method, which the recipient of the enciphered message can apply in reverse to unwind the permutation. (See https://en.wikipedia.org/wiki/Transposition_cipher) Now, it doesn't appear that the game did anything so complex... but if they had, it would be correct to call that a "cipher." 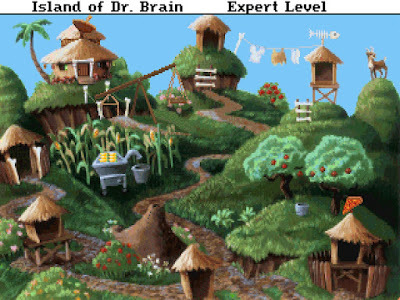 As to why homonyms would grind corn... having bred the course of that serial maze lets you produce bread using coarse cereal from maize. And since all anagrams are permutations of letters, and permutations are definitely a topic of mathematics (more precisely, group theory), there's even a sort of justification for including that puzzle among the mathematical ones. Still, no idea what the visual recognition is doing in mathematics. Ha, good one, Voltgloss! You're right, you could make a permutational cipher too, but ordinary anagrams aren't the same thing as that either. If it were an actual cipher (permutational or substitutional or whatever), then I could see this counting as a math puzzle, but there's no real math involved here. It's just textual analysis. a...watermelon? Where were the ants hiding that thing, and why? Yes, you're right. Sorry! Kiwi are from New Zealand. It took me an embarrassingly long time to realize that the "Synonym Apple" puzzle was a pun on "cinnamon apple". 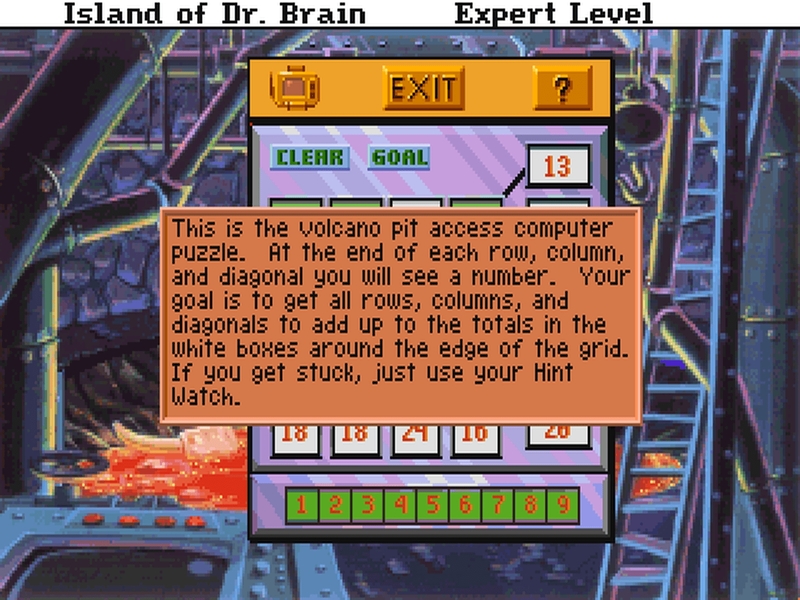 Of course you don't stand on the edge of the plate over the volcano: you would be dancing from one foot to the other going "ouch hot ouch ouch hot hot" while desperately trying to solve the puzzle in true cartoon style. Also, if it's a village for robots then my money would NOT be on those being animal bones! That said, a Kiwi could also mean an actual New Zealander (usually seen doing very complicated squats before a rugby game) or as I just found out a nickname for their Dollar as well. Thus if you say you've eaten a Kiwi before it can actually mean 3 entirely different things. Just a quick heads up that Full Throttle Remastered is free on GOG's homepage at the moment. The memories are flooding back reading these posts . . . kind of makes me want to play it again! Heads up that the Christmas rush is affecting all three reviewers in different ways. Expect a "A Mind Forever Voyaging" wrap-up in the next few days.